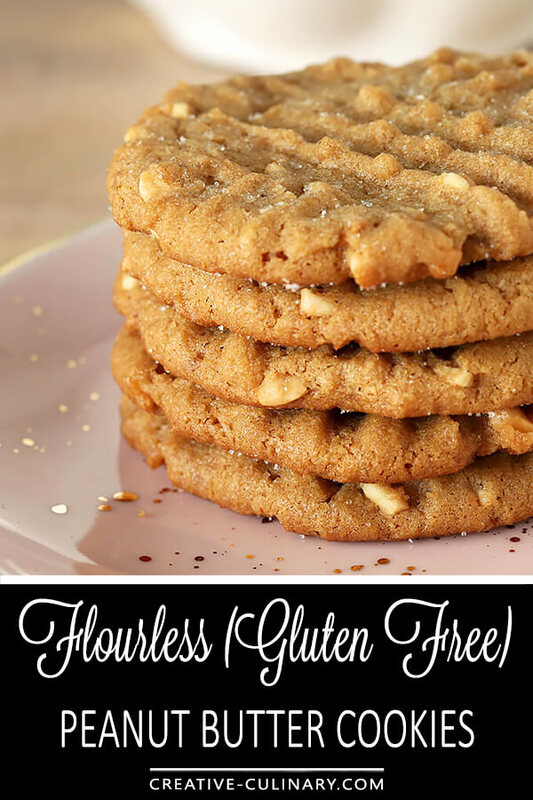 I made these Flourless (Gluten Free) Peanut Butter Cookies as a treat for my neighbor; they were so good I could have finished them off myself! You’re right; I’m not a Gluten Free blogger. It’s not something I have to worry about (thank goodness) and the recipes I typically develop or share on this blog don’t have to be devoid of much of anything. In this day and age I feel blessed because I know so many deal with food allergies; gluten, dairy, eggs, etc. And some of those people are my friends, including Amy across the street. She didn’t seem to have a problem when we first moved in but she has always dealt with Hashimoto’s thyroiditis; a disease of the Thyroid gland. She had tried several different doctors and remedies but nothing gave her relief until she cut gluten from her diet. It’s no secret I love to cook and I share a lot of that cooking with neighbors. I’m the one who has party central at my house and where we most often gather as a group and I have to give Amy credit; she’s never been a prima donna about her disease and is willing to bring something of her own to eat rather than make it difficult for me or anyone else. You know what happens when a person with food allergies takes ownership of their allergy and doesn’t think you should have to? You WANT to make things they can eat! I’ve found it’s just as tasty to serve pork barbecue on mashed potatoes as on buns and actually love it and I always buy corn tortilla chips now. I recently dusted the chicken in this Baked Chicken with Leeks, Bacon and Mustard dish with Bob’s Red Mill Gluten Free Flour since I knew I would share it with her, and I’ve always got a bottle of potato vodka handy so I can make us a quick cocktail. Simple things but enough to make an effort without hugely modifying either my pantry staples or techniques enough to be a big challenge for me. Where I’ve too often failed Amy though was in the dessert category. I want to accommodate but switching gears for baking is a big deal and not one I’ve actually been willing to jump into for one person. I love making cakes and pies and most often would simply serve Amy a bowl of ice cream as her sweet after a meal (and she was OK with that!). Recently I’ve been of a mind that I wanted to try my hand at a couple of sweet treats for her too. With some irony when I decided to try my hand at a flourless chocolate cake and was using my pal Google, I actually ran across recipes for flourless peanut butter cookies and loved how easy they were to make; so I decided one day last week to get busy with these first. I combined about three different recipes and ignored all of them when they called for plain peanut butter. 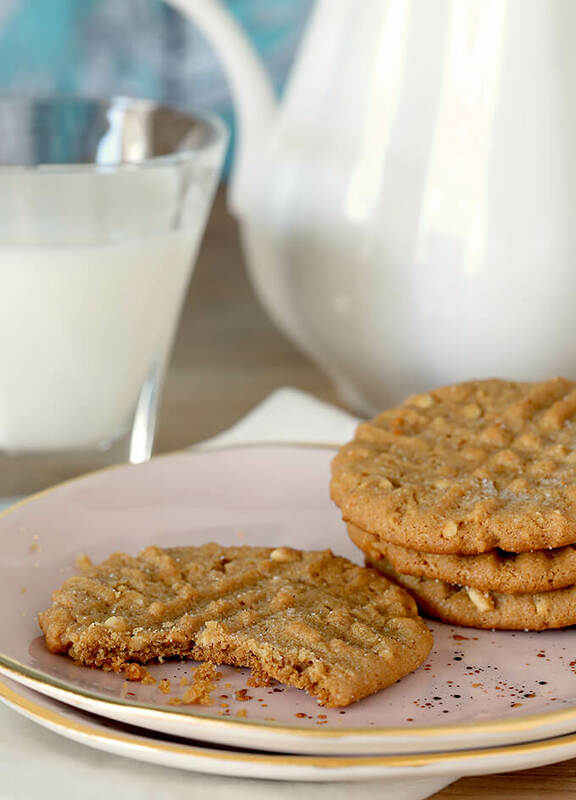 Use it if you want, but I keep only crunchy in my pantry and loved having that bit of crunch in these cookies too. And these cookies? Honestly delicious! It’s funny, if you live at altitude like I do; cookies struggle to have that same lift that they might at sea level; these cookies looked pretty normal to me! I had some other neighbors here the day I finished them and asked them to test the waters; only telling them that they had something unique about them. No guys; no bugs or anything, promise…and they got a hearty thumbs up from Sam and Sherry too. So I sent a couple over to Amy as a trial balloon, promising the rest as soon as I got photos completed. 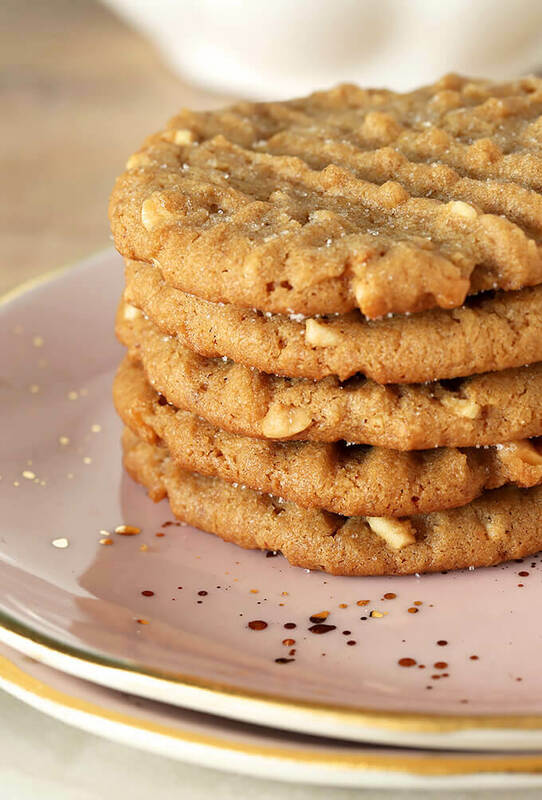 She told me she had not had homemade peanut butter cookies since her Grandma had made her some many, many years ago and was going to find a quiet space and get a glass of milk and really enjoy them. I did a flourless chocolate cake yesterday too. Honestly? It was just OK. The texture was good but for me, and maybe not for you, the chocolate ganache on chocolate cake was too much. I like more of a contrast with my regular chocolate cakes; preferring a contrast with a lighter buttercream frosting so I’m going to try my hand at a variation that brings that to the recipe before I post it and I promise; you’ll be the first ones to know! 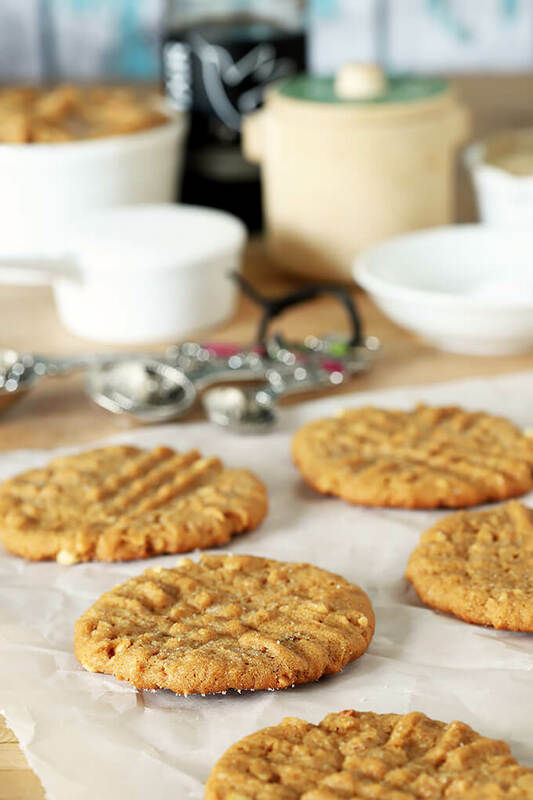 In the meantime, make these Flourless (Gluten Free) Peanut Butter Cookies for someone you know that needs to cut out gluten and well, make sure you don’t devour them all yourself! In a mixing bowl, cream peanut butter, white sugar, brown sugar, baking soda, and salt until smooth. Scoop dough using a Tablespoon measure and place on the prepared cookie sheets spacing them 2 inches apart. Using the back of a fork, gently press down on the tops of the cookies to flatten them; do both directions. Lightly sprinkle the tops of the cookies with granulated sugar (optional). Bake for 10-12 minutes, rotate trays halfway through baking. This looks really good! We eat gluten, too, but know a lot of people who don’t. So always good to have recipe we can make for them. Thanks!